Lately this soup has been rockin’ my world. Those who know me well (like my huz, who will make fun of me incessantly about it) know that for a soup to be good in my book, it’s gotta be hearty. 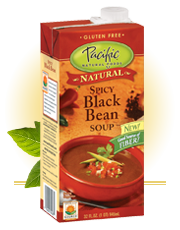 That is why when I click on the Pacific Natural Foods website and I see a whole category devoted to “hearty soups”, I’m stoked. Technically the black bean option, my personal favorite, is in the creamy soup category but who is counting, right? Why am I so stoked on soup you ask? Let’s just say that wintertime soup, as an afternoon snack, serves the role that a nice frothy smoothie plays in offering me solace and harmony on a hot summer day. It’s the Yin to my Yang. It balanced me out. And after you read below you too are going to want to grab yourself a carton of this ready-made delight OR go for it and make your own. Let’s say it’s about 3pm and your feeling that mid-afternoon energy lull. You’re hungry – slightly, but more like you have the munchies. You’re restless from working all day and a tasty treat gives you the mouth experience of a little vacation from the daily tasks. Now it would be REALLY tempting at this time to grab a coffee drink (do you need more caffeine? ), a crunchy, munchy snack (is it a good idea to go down that carb-craving road?) OR you could satisfy your urge with a modest yet flavorful cup o’ soup. Here’s what I know: When I sip on a cup full of this spicy, yet creamy soup it warms my tummy, it satisfies my flavor palate, it gives me a strong sense of having made a good choice for my body, and it keeps me from craving sugar as soon as I’m off of work. Halleluiah!! I’m telling you bloggies, do NOT underestimate the power of a little afternoon soup. PS: I once had a client who ate soup for breakfast every day. After months of trying to get her diet in balance and avoiding breakfast only to over-eat carbs and soda later, she went the unconventional route and enjoyed about 10 oz of roasted red pepper soup every day before work. Guess what? She shed 20 unwanted and unneeded pounds. Soup is no miracle worker, for sure. But it certainly can be a simple, inexpensive tool in your toolbox that helps keep you on the road to wellness. PPS: I’d love to you your favorite soups!